PHILADELPHIA -- Ah. The summer. Time for barbecues, beaches, and, of course, the annual road trip. You have it all planned out. You booked the hotel. You reserved the restaurants. You mapped out the fastest route to your destination - or Waze did (but you downloaded the app, so it still counts). You even made sure to rent the most cost efficient car. But hours into your journey on the open road, a light on the dashboard shines. Your gas gauge is almost reading empty and you know you need to fill up the tank. You find the nearest gas station - or Waze does (but you downloaded it, remember) - and pull up to the pumps - when panic strikes. "What side of the car is the gas tank on?" Sure, you've grown accustomed to your own car. You know, most of the time, which pump to pull up to, but this isn't your car. This is that cost efficient rental car that was all part of your master road trip plan. But now the gas tank shuffle is going to deter all your best laid plans. You try to check the side-view mirrors to see where the fuel door is located, but to no avail. Then you notice right near the gas gauge on the dashboard is an arrow. A triangle shaped arrow that is pointing left. Sure enough, you confirm. The gas tank is on the driver's side of the car - just like the arrow pointed. And a wave of relief passes through you. You can now go on with your road trip. Automotive industry experts suggest that only one in ten drivers know about the gas tank indicator arrow, AAA Mid-Atlantic says. They are in nearly all newer model cars built in the last 10 years. "If you are driving a newer car, as many rental cars are, then take a look at the arrow by the gas gauge on your dashboard. Depending on your car, it may look like an arrow or a triangle pointing to the left or to the right," AAA says. The indicator appears next to the fuel icon. 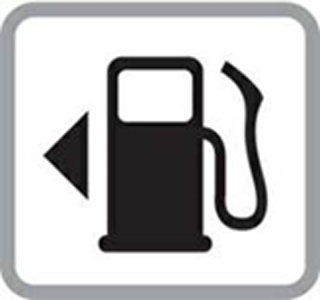 However, while the indicator arrow is always pointing in the correct direction of the gas cap, the same cannot be said for the fuel handle image. 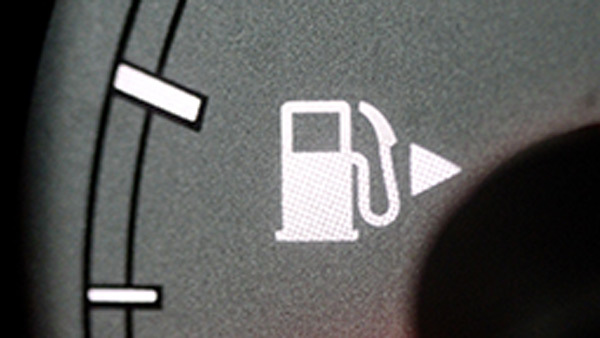 In fact, in some cars, the indicator arrow is pointing to the left, while the fuel handle is on the right. "To confirm, it's the arrow that signifies where the gas cap is," AAA says. AAA says there's no agreement among auto manufacturers as to which side the gas cap should be on, so these little indicator can offer big benefits to commuters. "Additionally, it's a great reminder for those stopping for a top-up during the commuting rush because we all know that we can do silly things or be forgetful when we are in full-on stress mode," AAA says. As for that road trip, you won't be alone, as more than one-third of Americans are planning to take a vacation of 50 miles or more away from home involving two or more immediate family members this year, according to AAA. Seventy-nine-percent of families will be taking a road trip, which is the top vacation destination in AAA's survey, while 51% will be visiting national parks, followed by 40% for theme parks. And now that you'll have no trouble knowing which side of the car to pump the gas, you may be happy to know that locally and nationally, gas prices have been dropping. The national average for a gallon of regular unleaded gasoline is $2.28, down from $2.32 a week prior. In Philadelphia and the surrounding suburbs, the average is $2.50, down from $2.55. South Jersey's average is $2.22, down from $2.27. And Delaware's average is $2.20, down from $2.23. But gas tank location is not the only issue for road trippers. AAA says it expects to rescue 7-million American drivers this summer, with the majority facing battery, lock and tire-related issues. Windshield Wiper Blades - If wiper blades are worn, cracked or rigid with age, they will not adequately remove rain, grime and other debris that can obscure driver vision. If the wiper blades are sufficiently deteriorated, the metal wiper blade frame could contact and permanently damage the windshield. Tire Pressure - Check and adjust tire pressure, including the spare. Always inflate tires to the vehicle manufacturer's recommended settings-not the maximum pressure molded on the side of the tire. Tire Tread - Check the tread depth by inserting a quarter upside down into a tire groove with Washington's head facing outward. The tread should cover part of Washington's head. If any of the area above Washington's head is visible, it's time to start shopping for new tires. Battery - Have your battery checked, especially if it is over three years old. Summer heat breaks down the battery internally and accelerates the rate of corrosion on vehicle's battery terminals. Vehicle Emergency Kit - AAA recommends every driver have a well-stocked emergency kit in their vehicle. The kit should include water, non-perishable food items, jumper cables, a flashlight with extra batteries, road flares or an emergency beacon, basic hand tools, and a first aid kit. Drive distraction-free - Do not text or engage in distracting activities while driving, including interacting with a cell phone, talking with passengers or looking at other objects in the vehicle. So make sure you are prepared, tell your friends about the gas tank indicator (though, there's a 10% chance they might know), and safe travels!